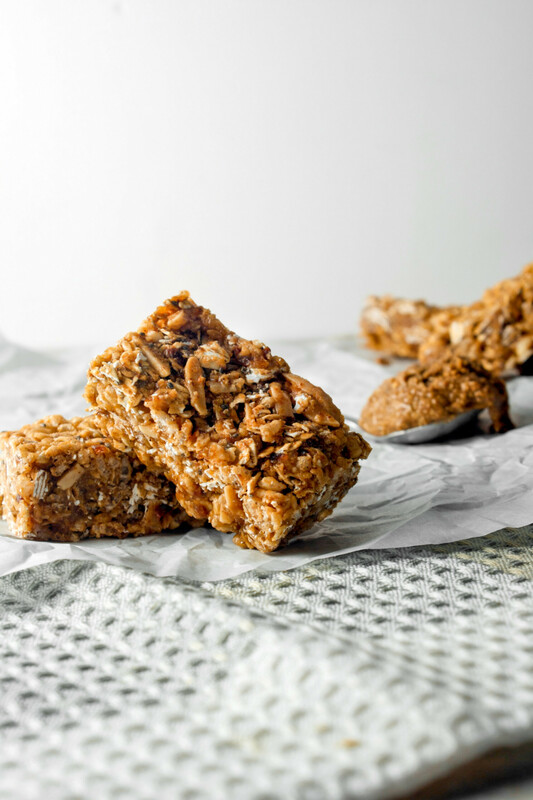 These healthy no-bake granola bars are a delicious and satisfying snack or breakfast. 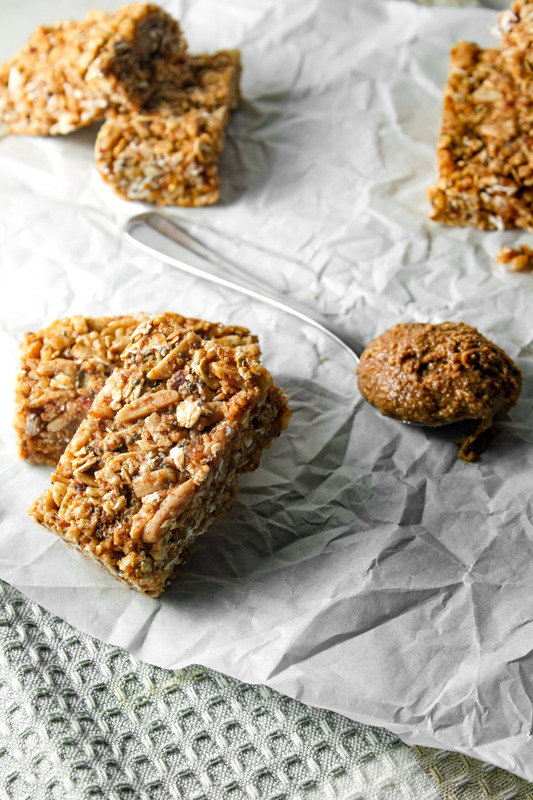 Packed with wholesome ingredients, these bars are 100% naturally sweetened and offer a good amount of healthy fats and fiber. 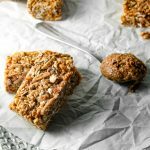 These healthy no-bake Almond Butter Granola bars are a deliciously healthy version of a favorite childhood treat, Scotcharoos. There’s always that one person who makes the best Scotcharoos around. You know what I am talking about, we all claim to know one, or even be one. Some people cook the peanut butter and corn syrup together, others don’t. Some strictly use milk chocolate for the top, while others mix milk chocolate with a few butterscotch morsels. Rice Krispies or Special K? You get it; the variations are endless, while the treat itself is pretty simplistic. But I must say, not all Scotcharoos are created equal. In all honesty, no Scotcharoo is as good, nor will it ever be, as Gusty’s. That’s just my opinion though. One of the best things about her Scotcharoos was that she always cut them into bite-sized pieces. Barely a 1-inch square, they were the perfect treat to pop in your mouth. Ten treats later and you’d have no idea how much you actually had eaten. 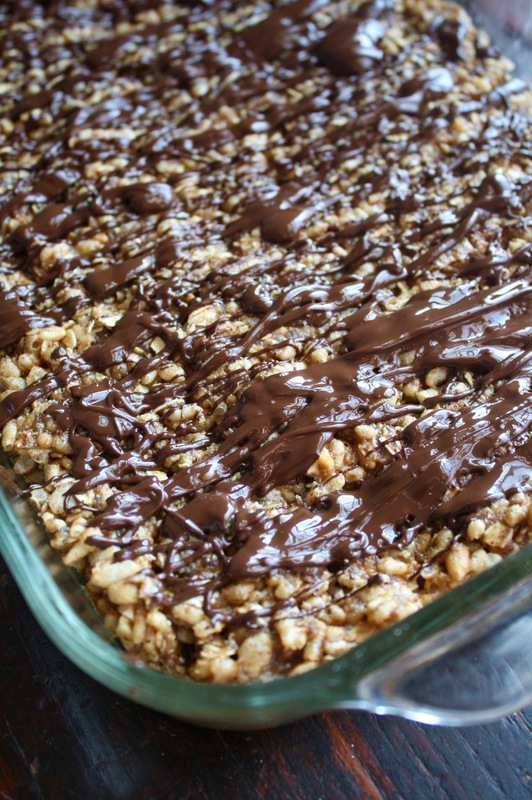 Stored in the refrigerator, the chocolate layer was always crunchy and the cereal layer was perfectly chewy. Boy, they were good. I’ve tried for years to make them the way Gusty does. Even using her recipe, I can’t quite make them the way she does. instead of messing with something so perfect, I decided to take this inspiration in a slightly different, healthier direction. This recipe uses almond butter instead of peanut butter and a combination of dates and maple syrup for the sweet, syrupy component. 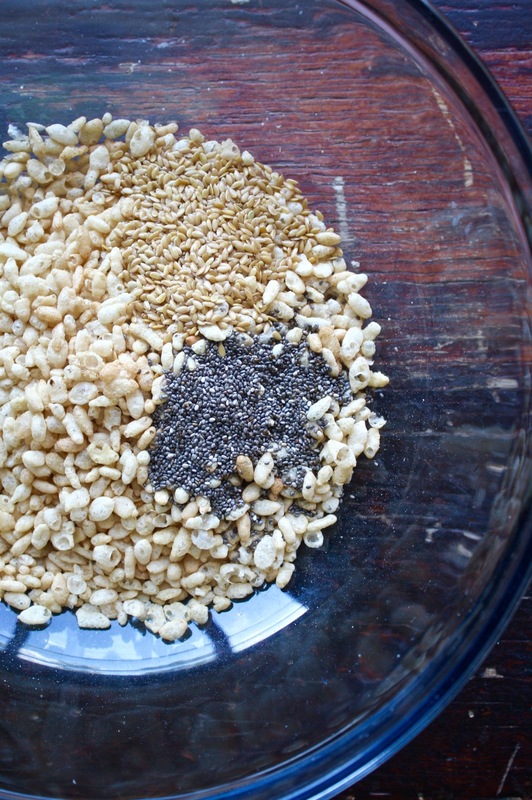 Then oats combine with puffed rice cereal, chia seeds, and flax seeds for a healthy base. 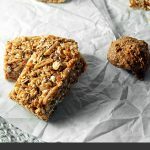 Although these are granola bars by name, they also make a great healthy dessert — especially if you add a drizzle of dark chocolate! Heat oven to 350°F. 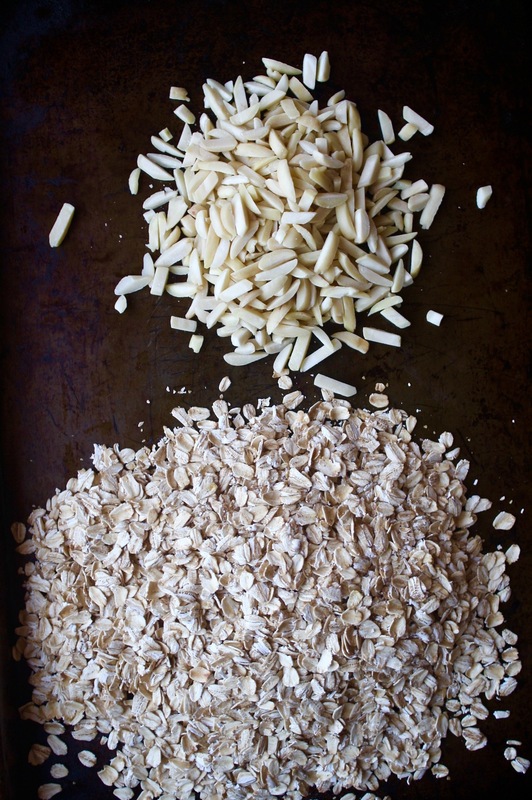 Combine oats and almonds on a baking sheet and toast for 10 minutes. Set aside to cool, then combine with rice cereal, chia seeds, and flax seeds in a large mixing bowl. Process dates in a food processor until a thick paste forms. Add water by tablespoon, mixing after each addition, and scraping down sides of bowl. Heat almond butter, maple syrup, and vanilla in a microwave-safe bowl for 1 minute on high. Add salt and cinnamon and whisk to combine. Add almond butter mixture to food processor in two additions, mixing to combine after each addition, and scraping down sides of bowl as needed. Add date mixture to oat mixture and mix until thoroughly combined (set down the spoon and get your hands dirty, this is a sticky mixture). Transfer mixture to prepared pan and press into an even layer. In a double boiler or glass bowl set over a pot of simmering water, melt chocolate until smooth, drizzle or spread over bars then sprinkle with salt. Chill, until chocolate is set, before cutting. Store in an air-tight container in the refrigerator for up to 1 week. I like these chilled right out of the refrigerator; the chocolate is crunchy and the base is chewy. Do you meal prep? 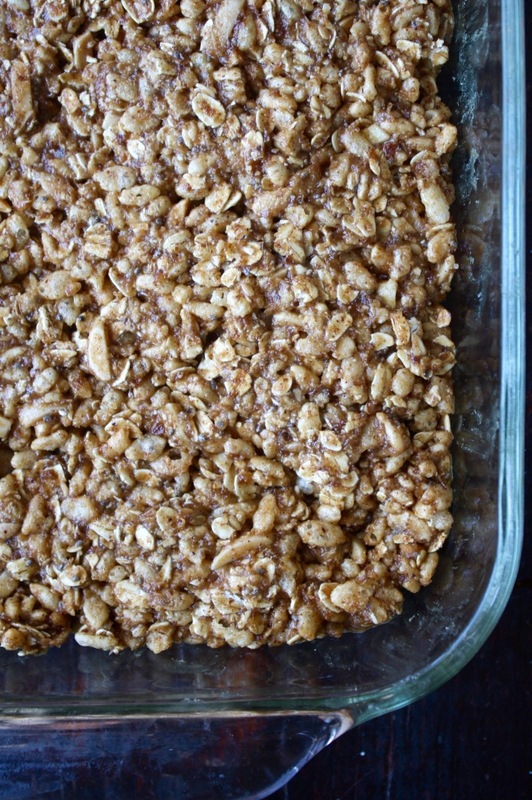 Pin these granola bars for your next big cooking day! These look absolutely amazing! I love almond butter! Thanks Kathryn! Me too, I can’t get enough of it! These look exactly like store-bought…which is of course what my kids like. I’ve been looking for a homemade version forever. I’ve found it. Thank you! I hope they enjoy them! Thanks Serena!